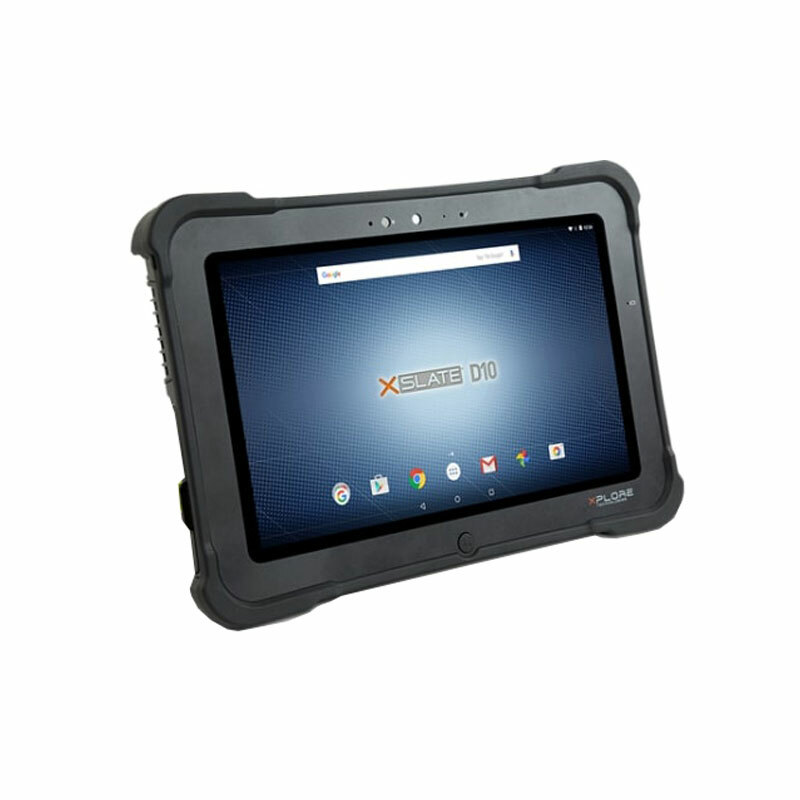 Extremely robust and highly versatile, due to a wide range of accessories, is the Xplore XSLATE D10 Android tablet computer by Zebra an indispensable work tool for in- and outdoors applications. Because of its light weight, it can be conveniently taken along to wherever the job needs to be done. Its rugged design ensures dependable operation even under challenging circumstances. The Xplore XSLATE D10 by Zebra is also suitable for hazardous environments. Equipped with all the communications options needed and various connectivity possibilities, the Xplore XSLATE D10 enables flexible mobile computing. The robust tablet computer Xplore XSLATE D10 by Zebra comes with an Intel ATOM Bay Trail E3845 quad-core CPU. It provides 4 GB RAM and 64 GB SSD storage which can be extended via Micro SDXC card. The versatile mobile computer runs the Android 6.0 operating system. The Zebra Xplore XSLATE D10 excels with its ultra-sturdy construction. Its internal magnesium-alloy structure ensures stability and yet enables a light weight of the device. Rubber bumpers protect the edges. The rugged mobile computer is sealed against the ingress of water and dust according to protection class IP65. It is also resistant against many aggressive liquids, such as disinfectants or bleach solutions. The device survives drops from as high as 1.52 m. The XSLATE D10 can withstand vibration and shocks in compliance with MIL-STD-810G standards and it is C1D2/ATEX certified for the use in explosive environments. Its operating temperature ranges from -34 °C to +60 °C. For convenient operation, the Xplore by Zebra XSLATE D10 Android tablet is equipped with a 10.1-inch display. 500 Nits brightness enable excellent viewability even in bright sunlight. Direct bonding technology ensures high durability of the screen as well es brilliant image rendition and less reflection. The 10-finger multi-touch display is glove-enabled. The Zebra Xplore XSLATE D10 tablet comes with two integrated cameras. If required, the slate computer can be additionally equipped with a 1D/2D barcode reader or a smart card/CAC reader for quick and easy data capture. By means of the optional companion keyboard, the tablet can be transformed into a laptop for more versatile use. The standard battery can be extended with high-capacity batteries for up to 15- or 22-hours runtime. The batteries are hot-swappable. Wi-Fi connection as well as reliable GPS and Bluetooth are provided as a standard. Additionally, 4G LTE is available for extended mobile connectivity. The Xplore XSLATE D10 by Zebra is equipped with USB 3.0 (2 x), Micro SDXC card slot, Micro SIM card slot and Micro HDMI-out port. An HDMI-in port module is available as option. To ensure security, the XSLATE D10 comes with TPM module and the hardware can be equipped with a Kensington lock slot. Please let us know if we can advise you on the selection of optional accessories and matching consumables. Call +49 511 76920-0, send us an e-mail to vertrieb@globos.de or complete the form below. We would like to call you back.